Almirall is a global science partner that leads the fight against skin problems and diseases – skin prevention, skin care and skin improvement – , through medical solutions that provide health professionals and their patients a healthy future. Since 1943, we are supporting our partners and patients in the continuous health improvement, bringing our innovative solutions where they are needed. Almirall is committed to support those who need us, understanding their challenges and applying science to solve them. AlmirallShare is the willingness to share efforts of those who struggle with passion to solve skin problems. An initiative where talent, wherever it is, works together to treat skin diseases. Empowering scientists to improve skin health and innovate for a better future. Bringing science and creativity together. 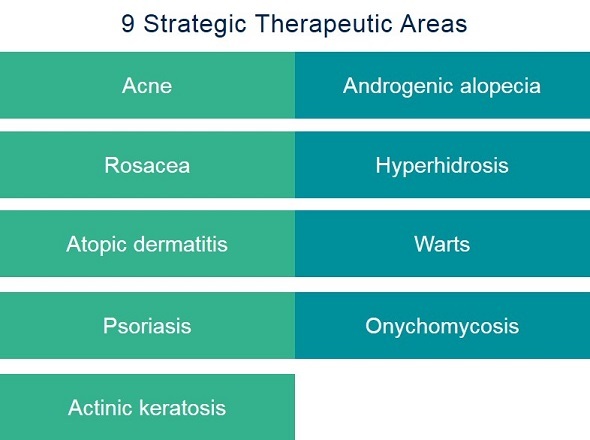 Our passion for science and innovation along with our market knowledge, led us to identify 9 important Dermatology conditions, with unmet medical needs in which we will strive to add the most value for patients. This encompasses conditions that are more common, to some rare diseases currently lacking effective treatment. It’s not only about providing treatment options. It’s about improving the patients’ quality of life.